The single volume Encyclopaedia of Medieval Dress and Textiles of the British Isles c. 450-1450 is a unique work that intends to bring together the latest research from across the range of disciplines which contribute to our knowledge of medieval dress and textiles. 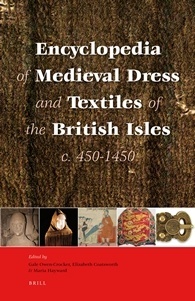 There has been a long-standing interest in the subject, which has recently manifested itself in a flowering of research and publications, including activities by the editors of the Encyclopaedia: the foundation of DISTAFF (Discussion, Interpretation and Study of Textile Arts, Fabrics and Fashion) as an umbrella organization for the presentation of papers at the major medieval congresses in Kalamazoo and Leeds (Netherton and Owen-Crocker); the establishment of the annual journal Medieval Clothing and Textiles (Netherton and Owen-Crocker); the Manchester Medieval Textiles Project (Coatsworth and Owen-Crocker); and the AHRC Lexis of Cloth and Clothing Project (Owen-Crocker and Sylvester). There is a clear need for an interdisciplinary reference work which will introduce readers to various sources of evidence, and give clear information about the most recent discoveries and interpretations and bibliographical guidance to readers.